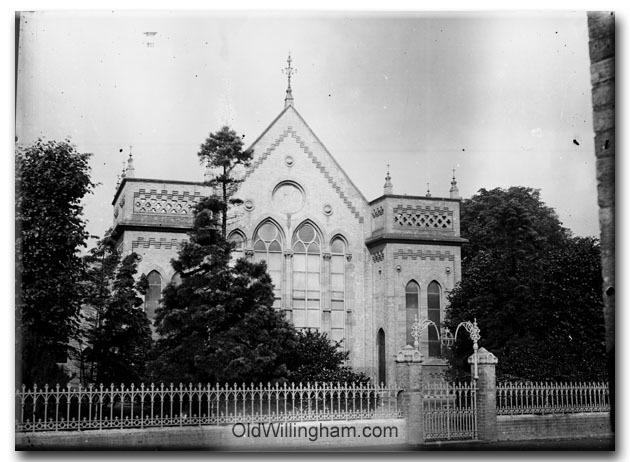 This impressive building is the Baptist tabernacle which stood on the site of the current “Tab” on George St. This was a huge building compared to the current modern one and could seat up to 300 people. It survived for around one hundred years until it was demolished in the 1980s. Efforts were made by conservationists to save the building but the cost of maintenance for such a large building was way beyond the congregation at that time. A copy of the building costs around 1870 shows that the land cost £466 (there was a house and four cottages on the site,) the Tabernacle cost £2925 and a house for the Baptist Minister was £430. The value of voluntary labour, including “carting 300,000 bricks” was estimated at £200. Have a look at the current tabernacle and you will see that the original gateposts remain.